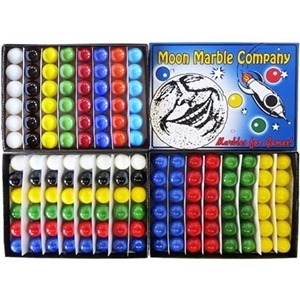 This Moon Marble Company Game Box contains 48 solid colored marbles which are great for game board pieces. Marbles are approximately 5/8" in diameter or 16mm. Select from 3 box arrangements that offer you 4 colors, 6 colors, or 8 colors of marbles. Marbles may vary slightly in size and color. Warning: Choking Hazard. Not recommended for children under 5 years.